Spock hoodie for all the ladies out there at Her Universe. Being a Spock fan I love it but I find the extension of the flesh color a little creepy. 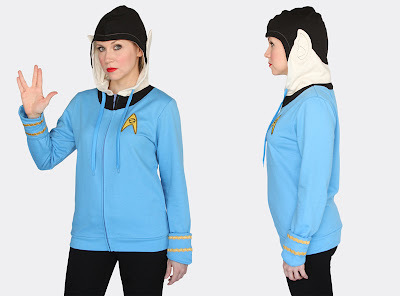 Live Long & Prosper this Winter! To bad they don't come in dude sizes, or I guess I should say too bad I can't wear a smaller size, cause I would so wear that.